This Paseo is in INCREDIBLE shape!! NO RUST!! Only a couple of minor dents and scratches. Don't let those miles fool you 103K is how much is on it, but I do use this as a daily driver and the longer you wait the more miles it gains!! I recently done some engine work done on it, new after market clutch, new radio and floor mats! I love this car, I'd keep it but I need to fix my other car I have which is a 01 Celica. To get the money I need to sell this ASAP!! If interested email me @ airsofter560@hotmail.com. 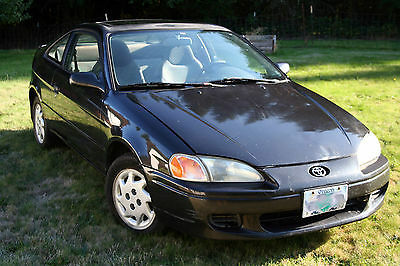 This Toyota is a 1996 Paseo, which is a 2-door coupe built on a Tercel chassis. It gets an average of 35mpg. The Paseo has 4 seats and is a 5-speed. The car has never been in a big accident, but a low speed fender-bender did crunch the hood a little (see pictures). It has the check engine light on, but it is for the oxygen sensor and does not effect the regular running. When we bought the car for my daughter, we replaced the catalytic converter and most of the exhaust/muffler, and replaced the timing belt. It has about 137K miles on it. It has a new registration good through Sept. 2017. It has a 1.5L engine. It runs very well and the interior is in good shape for a car its age. Some staining on the passenger seat, and some small holes in the upholstery, but overall good. The external has seen better days. There are a number of small to medium dings and dents including the gas cover, above the drivers door (I don't know how that one happened, it was before we owned it) and the hood. The clearcoat has come off on the roof and the rear wing. Asking $1700 for it, based on Kelly Blue Book. It runs very well and is highly reliable. We would not be selling it, but my daughter moved to Japan and we no longer need it. Its a great car for a beginning driver, or someone that wants some pep in their drive but not at the expense of gas mileage. This car is for sale locally, so we reserve the right to end the ebay sale at any time. 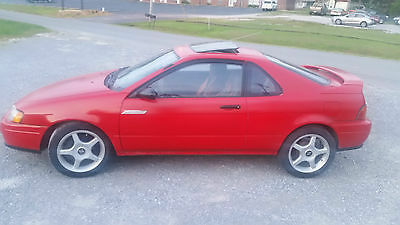 RARE 1994 RED TOYOTA PASEO IN FAIR CONDITION, HAS COLD AIR. CAR IS STILL IN BEING DRIVEN TODAY.. FOR MORE DETAILS AND TO MAKE A DEAL CALL CHRIS @ 256-636-6688 PICK UP OR DELIVERY/FEE OPTIONS AVAILABLE. EXTREMELY NEGOTIABLE LETS MAKE A DEAL, PLEASE!!! RARE CLASSIC LIMITED PRODUCTION! 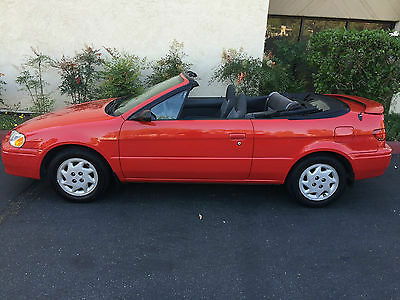 THE PASEO CONVERTIBLE WAS ONLY SOLD IN THE US IN 1997 AND ONLY SEVERAL THOUSAND. 18 YEARS LATER THERE ARE VERY FEW GARAGE KEPT CORROSION FREE ONE'S REMAINING. 30/35 MPG SUPER RED II EXTERIOR-- ORIGINAL PAINT, NEW CONVERTIBLE TOP PROFESSIONALLY INSTALLED, NEW TIRES. EXCELLENT FROM A TO Z. 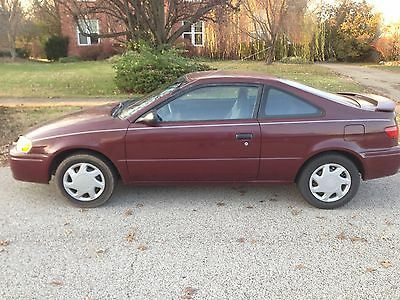 MECHANICAL--- EXCELLENT, MILD CLIMATE, GARAGE KEPT, VERY WELL SERVICED! EXCELLENT RUNNING SHIFTING AND DRIVING. SUPER COLD A/C INTERIOR--- EXCELLENT, NO DINGS OR DENTS, SOME CITY LIVING MARKS ON THE BUMPERS. SEE PHOTOS WE WILL HAPPILY ORGANIZE WHOLESALE LOW COST BONDED AND INSURED SHIPPING TO ANYWHERE IN THE WORLD. FOR A QUOTE PROVIDE A ZIP OR CITY AND COUNTRY. EXAMPLE PRICING-- CLAREMONT CA TO VEGAS $195, CLAREMONT TO MIAMI FL. $595 SUPER COOL SUPER EFFICIENT RED CONVERTIBLE THAT IS 5 SPEED MANUAL AND VERY FUN TO DRIVE!